Research is showing that among superconducting materials in high magnetic fields, the phenomenon of electronic symmetry breaking is common. Filip Ronning. No image credit. Common phenomenon could be key to understanding mechanism of unconventional superconductivity. A potential new state of matter is being reported in the journal Nature, with research showing that among superconducting materials in high magnetic fields, the phenomenon of electronic symmetry breaking is common. The ability to find similarities and differences among classes of materials with phenomena such as this helps researchers establish the essential ingredients that cause novel functionalities such as superconductivity. The high-magnetic-field state of the heavy fermion superconductor CeRhIn5 revealed a so-called electronic nematic state, in which the material’s electrons aligned in a way to reduce the symmetry of the original crystal, something that now appears to be universal among unconventional superconductors. Unconventional superconductivity develops near a phase boundary separating magnetically ordered and magnetically disordered phases of a material. 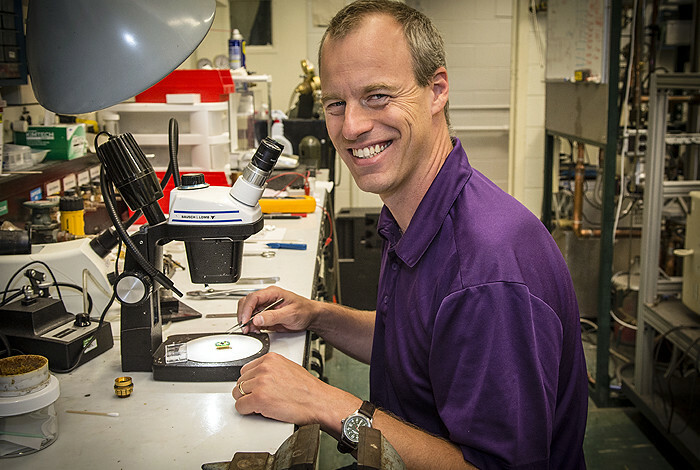 “The appearance of the electronic alignment, called nematic behavior, in a prototypical heavy-fermion superconductor highlights the interrelation of nematicity and unconventional superconductivity, suggesting nematicity to be common among correlated superconducting materials,” said Filip Ronning of Los Alamos National Laboratory, lead author on the paper. Heavy fermions are intermetallic compounds, containing rare earth or actinide elements. “These heavy fermion materials have a different hierarchy of energy scales than is found in transition metal and organic materials, but they often have similar complex and intertwined physics coupling spin, charge and lattice degrees of freedom,” he said. The work was reported in Nature by staff from the Los Alamos Condensed Matter and Magnet Science group and collaborators. Using transport measurements near the field-tuned quantum critical point of CeRhIn5 at 50 Tesla, the researchers observed a fluctuating nematic-like state. A nematic state is most well known in liquid crystals, wherein the molecules of the liquid are parallel but not arranged in a periodic array. Nematic-like states have been observed in transition metal systems near magnetic and superconducting phase transitions. The occurrence of this property points to nematicity’s correlation with unconventional superconductivity. The difference, however, of the new nematic state found in CeRhIn5 relative to other systems is that it can be easily rotated by the magnetic field direction. 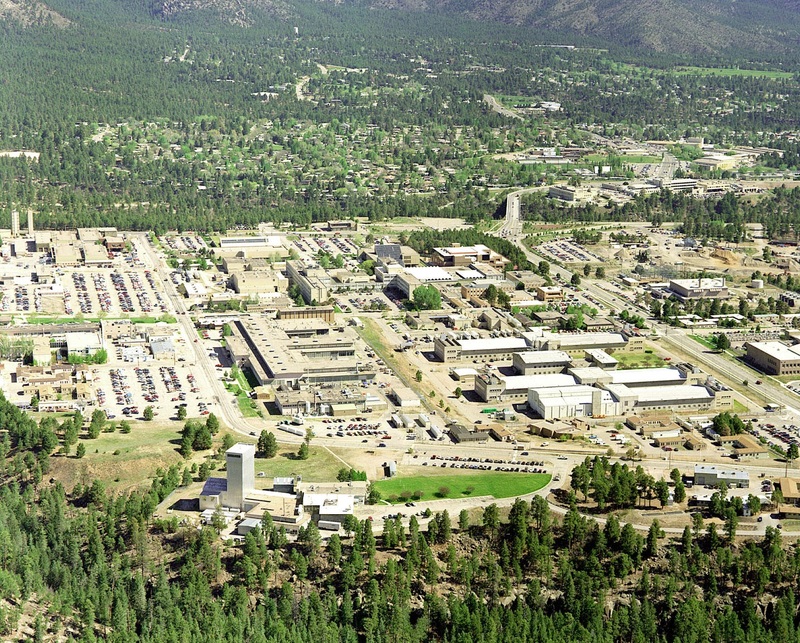 The use of the National High Magnetic Field Laboratory’s pulsed field magnet facility at Los Alamos was essential, Ronning noted, due to the large magnetic fields required to access this state. In addition, another essential contribution was the fabrication of micron-sized devices using focused ion-beam milling performed in Germany, which enabled the transport measurements in large magnetic fields. Superconductivity is extensively used in magnetic resonance imaging (MRI) and in particle accelerators, magnetic fusion devices, and RF and microwave filters, among other uses. Researchers: Filip Ronning, Mun K. Chan, Brad J. Ramshaw, Ross D. McDonald, Fedor F. Balakirev, Marcelo Jaime, and Eric D. Bauer (Los Alamos National Laboratory); Luis Balicas (Florida State University); Toni Helm, Kent Shirer, Maya Bachmann, and Philip J.W. Moll (Max-Planck-Institut for Chemical Physics of Solids – Dresden).